Glass paint has a lot of practical applications, but you can also use Glassprimer™ glass paint on windows to add an artistic touch to any space. Whether you’re looking to create an interior glass painting, or dress up an exterior window, Glassprimer™ glass paint offers the widest range of color and opacity options on the market today. Glassprimer™ glass paint offers opaque, translucent and transparent options. Using translucent and transparent glass paint on windows will allow light to pass through the glass, and gives you an option to quickly create a stained glass look. Creating stained glass is a time-intensive process. 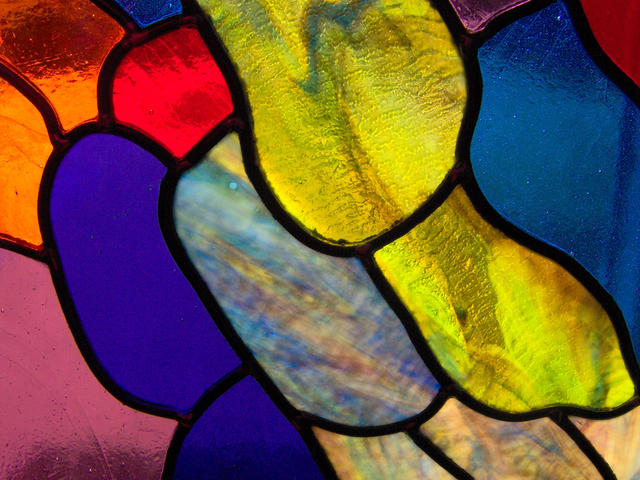 Stained glass artisans typically fire the glass after each layer of coloring. This method substantially increases the time needed to complete an entire stained glass project. Not surprisingly, true stained glass is also expensive. Currently, stained glass has an average cost of about $300 per square foot for non hand-painted glass, and nearly $1,000 per square foot for hand-painted stained glass. A 3′ x 5′ stained glass window would cost somewhere between $5,000 and $15,000, depending upon the techniques used to fabricate the glass, and not including the cost of installation. It’s not an understatement to say that might be out of the budget of many people! As a cost effective alternative, glass paint on windows can create a similar look at a fraction of the cost. Glass paint is rated for both interior and exterior use. It is UV-resistant, and will not chip, fade or peel. It can also withstand temperature extremes, and creates a permanent bond with glass. In interior applications, you can create backpainted glass that can be framed, mounted onto a wall or used to create divisions in open spaces. If you’d like more information about using glass paint on windows or for other decorating ideas, please check out our site. To purchase glass paint, please visit our online store.